Registration: 8–9 a.m. | Sessions: 9 a.m.–4:30 p.m. Optional citrus-themed dinner: 6:30 p.m. Admission is $70 per person, $60 for teachers, students, THNOC members, and industry professionals. Dinner is an additional $100 per person. This year's event will feature presentations on citrus offering an entertaining, illuminating, and a-"peel"-ing look at this diverse family of fruit. Speakers include celebrity British chef Jeremy Lee, Pierre Laszlo, Justin Nystrom, Rick Ellis, and more. In addition, attendees are invited to an optional citrus-themed dinner at the Napoleon House, where guest chefs Jeremy Lee and Jeremiah Tower will join executive chef Chris Montero to create innovative dishes. The menu is below. Admission to the symposium is $70 per person; $60 for THNOC members, teachers, students, and industry professionals. Registration includes Saturday's talks and a happy hour reception. Click the link at the top of this page to register. Dinner, which requires separate registration, is an additional $100 per person. When Life Hands You Lemons, Make a Drink! 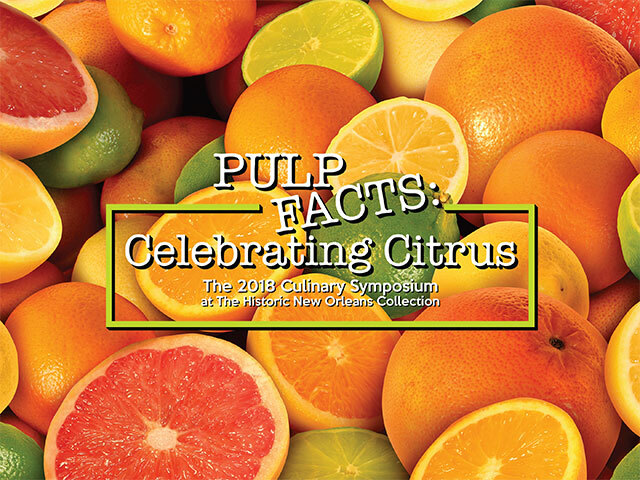 “Pulp Facts: Celebrating Citrus” is presented by The Historic New Orleans Collection with support from the following sponsors. Like this event? Why not make a weekend out of it and consider attending Brennan's Southern Foodways Alliance Benefit Lunch on Friday, June 8.